From artists to designers, several flooring manufacturers have formed collaborations with some of the best in the creative industry to produce flooring with stunning patterns, textures and colours. One such collaboration is that of award-winning, woven textile designer Margo Selby whose designs feature in two of Alternative Flooring’s wool carpet ranges, both available from Flooring 4 You. So, who is Margo Selby? Margo is the spearhead behind the Margo Selby Studio, a woven textile design company which makes exceptional, high quality textiles for interiors. Having trained in textile design at Chelsea College of Art and Design, Margo went on to do a postgraduate degree at The Royal College of Art. After graduating, Margo went into employment as a woven textile designer for industrial mills. It was here where she was able to merge her expertise in weaving with industrial machinery, to create the stand-out 3-dimensional fabrics she has become renowned for and have become the trademark of the Margo Selby brand. Margo has pushed the boundaries of weaving to create contemporary, stylish graphics for a range of interior textile applications made from the best quality fibres. Her hand-woven textile concepts are developed with specialist mills and artisan weavers to create products such as carpet, rugs, furnishing fabrics and accessories. 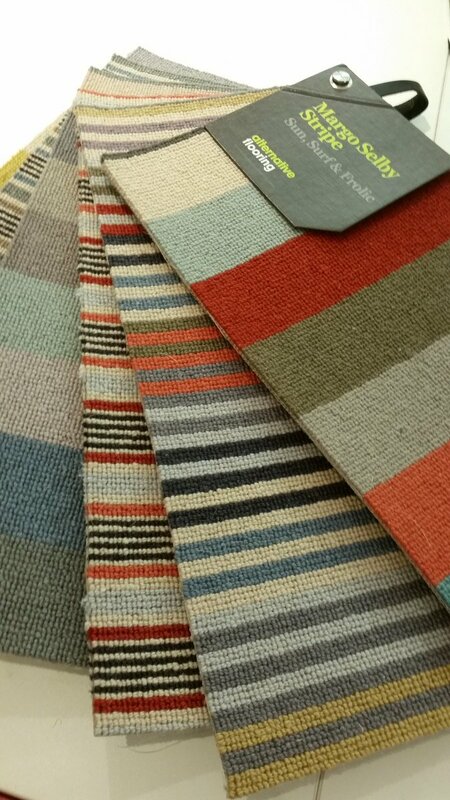 Showing: Swatches of Margo Selby Stripe carpet from Alternative Flooring, available to view at all our Flooring 4 You showrooms. It was back in 2014 when Alternative Flooring reached out to Margo Selby to invite her to contribute designs to their new Quirky B range. As well as being a creative brand with ideas and energy, British carpet manufacturer Alternative Flooring shares a similar design philosophy with Margo Selby, in that creating any kind of textile, even a carpet is both a craft and an art. Alternative Flooring make carpets as part of a time-honoured tradition, using Axminster and Wilton looms, and employ the expertise of skilled craftsmen at every stage. Meanwhile Margo Selby develops her designs on traditional hand looms before developing them for flooring. To date, Alternative Flooring and Margo Selby have two exciting, colourful collections together. 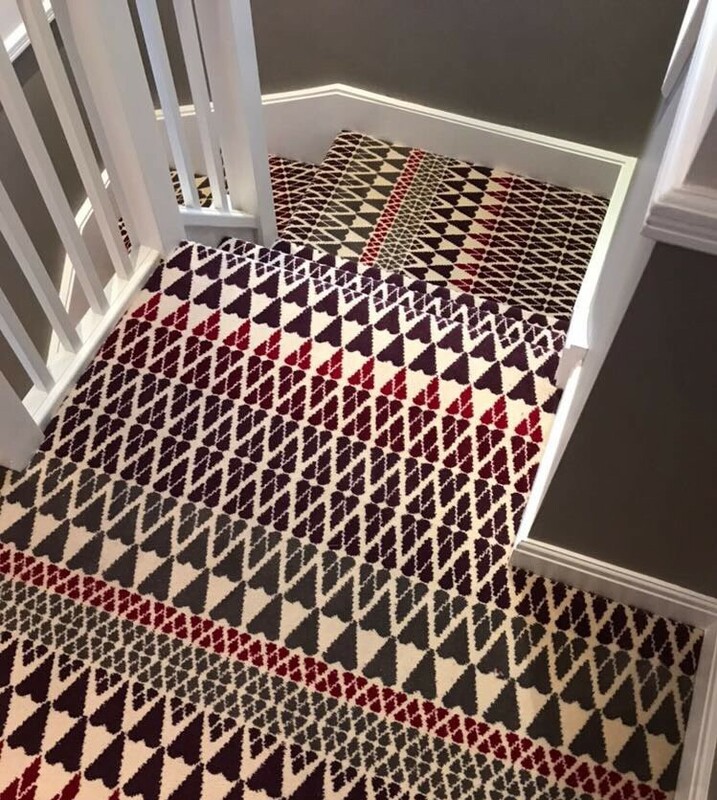 Showing: Alternative Flooring Margo Selby Quirky B Fair Isle Reiko carpet installed to a stairs and landing by Flooring 4 You, at a home in Bowdon. The Fair Isle design is also available as a 0.69m wide runner. The first is the Margo Selby Quirky B collection, inspired by a collection of deflected double weave hand-woven cloths which were first developed on the hand loom in the Margo Selby studio. The uniformed, angular, geometric designs started life as soft silk and wool fabrics before being enlarged and re-coloured to make them suitable for flooring. The patterns in the Quirky B collections are inspired by the weaving process, with the uniformed geometric shapes reflecting the structed nature of the craft. The Shuttle pattern comes from the Margo Selby Studio on handwoven deflected double cloth weaves, while the Fair Isle is inspired by the studio’s silk jacquard collection. All designs in the Margo Selby Quirky B collection can be made into bespoke patterned rugs, complete with your choice of border and trim. 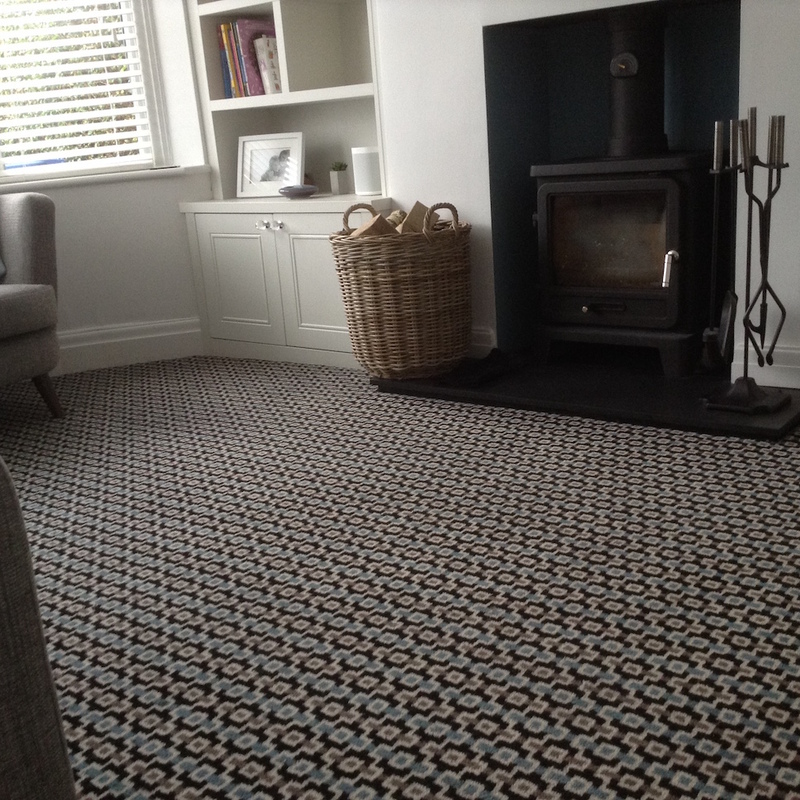 Showing: Alternative Flooring Margo Selby Quirky B Shuttle Silas fitted to a lounge in Altrincham by the Flooring 4 You carpet fitting team. The second collection, the Margo Selby Stripe Collection, is inspired by Margo’s hand-woven artworks and their colour palettes. The exploration of stripes is a fresh take on a classic design staple, and being intrinsically linked to the process of weaving, was perfect for a collaboration with Margo. Describing the design process involved, Margo confirms the designs were originally created by hand in her studio, where she wrapped coloured yarns around large strips of card. She produced lots of these card windings, exploring different ideas and combinations for both colours and stripe scale. Once the stripe designs were perfected, Margo went on to create three colourways in each stripe pattern. 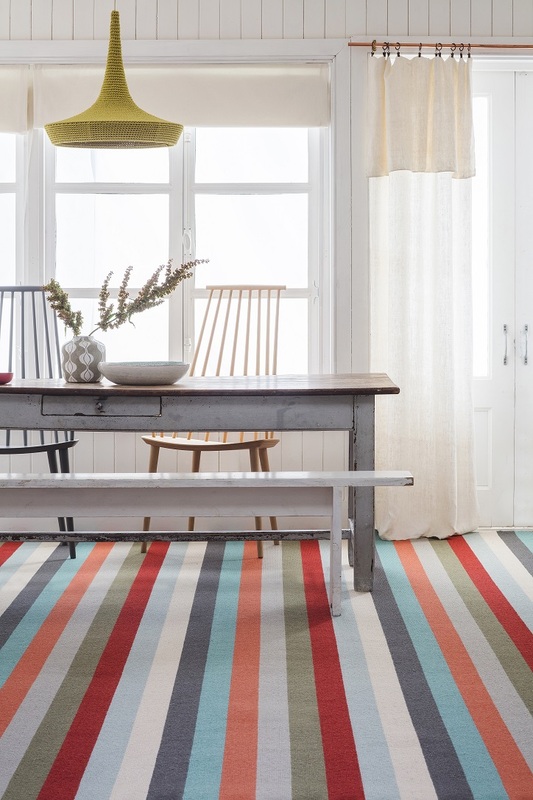 Showing: Alternative Flooring Margo Selby Stripe Frolic in the Stripe collection, this colourful block stripe carpet is available from Flooring 4 You. The Stripe Collection comes in nine stripes: three block stripes, three pencil stripes and three ticking stripes in Sun, Surf and Frolic shades. Each stripe is versatile, creating a balance of colour that can be mixed and matched through the home. 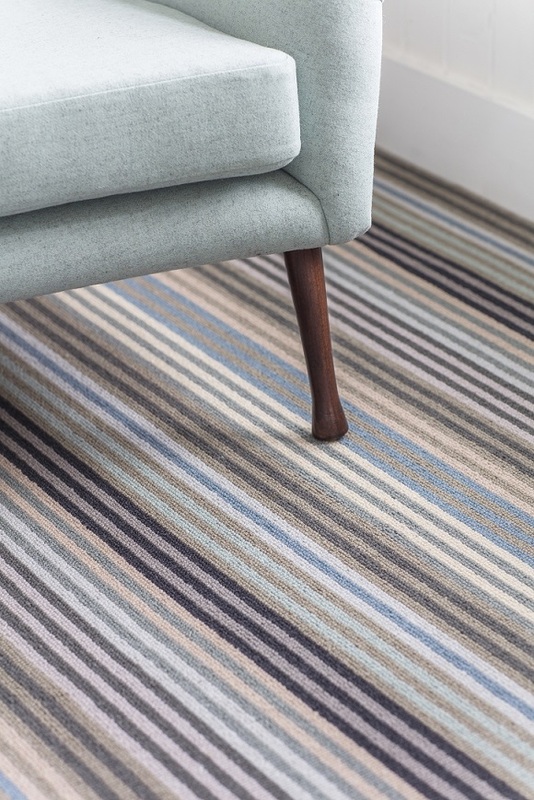 The Stripe collection can be installed as a wall-to-wall carpet or a made to measure runner or rug. Showing: Alternative Flooring Margo Selby Stripe Surf Botany carpet in a pin stripe linear pattern would look perfect as a runner for the stairs. If you love the look of the Alternative Flooring Margo Selby collaboration, visit one of our showrooms to see samples of both the Quirky B and the Stripe collections. You can also appreciate the quality of these 100% wool carpets which can be made into a rug or a runner to suit your home style. For a free estimate for Alternative Flooring carpet for your home, contact us to make an appointment. Alternatively, call into one of our showrooms to start designing your Alternative Flooring Margo Selby rug today!